Less than a century ago it was believed that there was no way for humans to fly, in fact the very thought itself was close to being heretical. Since its infancy, manned flight has come a long way. Today every town in the North worth its salt has a skyport, and there's hardly a single kingdom in Eria without its own air-navy. Though surface ships and ox-and-horse still dominate the mercantile world, wealthy passengers and luxury goods are being shipped with skyships to an increasing extent every year. Gun-balloons build on the earliest principles for flight. Still, the ones deployed today have come a long way from the early Pendrellian flying platforms. These are often constructed using witchwood planks, a naturlly buoyant tree found in northern Livonia and The Wild, thus making them capable of carrying several cannons with crews. Gun-balloons are not particularly manoeuvrable and will often be towed into position, or simply remain tethered in place. The Livonian Peregrine corvettes represent the most advanced in current ship-building technology. 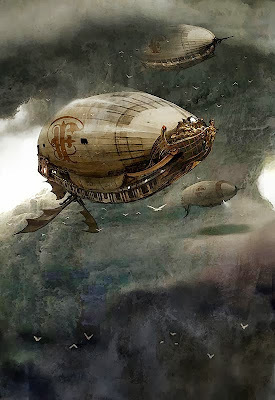 Constructed using witchwood and niebelite (a light and durable metanormal alloy), with an incorporated dirigible of Umbrian silk, these vessels actually rely on ballast to avoid rising out of control. What really sets them apart are their twin rotating propulsion screws, one on either side of the hull. These devices are powered by an ethereal combustion engine, a retro-engineered technology based on the same principles that is used in Thulean goethic reactors. Combined these factors make the peregrines among the fastest ships in the skies, capable of carrying more guns per tonne than almost any other ship. Next to the sleek corvettes of the Livonian navy, the massive Wezellian skygalleons seem slow and clumsy. To some extent that is true, but it is also a testament to the tradesmen's calculating temperaments. The galleons are designed so as to provide a balance between armament, cargo capacity, and price. What they lack in finesse they make up for in brute force and numbers, and the sight of a dozen of the lumbering galleons bringing their 25 gun broadsides to bear is often enough to deter all but the most stalwart of enemies. 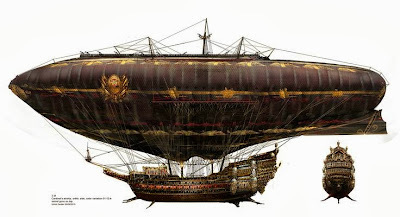 Few argue that the Royal Pendrellian Argonauts were the pioneers of flight. 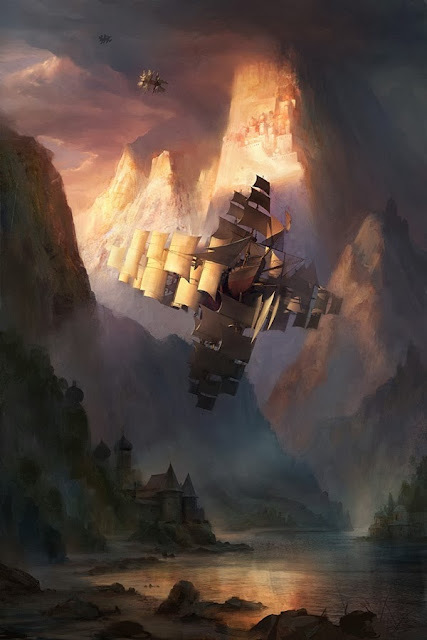 Master Galan, captain of the Pius, the first real flying ship, was himself one of them. Since the war, the order has come to be seen as the heroes and protectors of the ravaged nation. 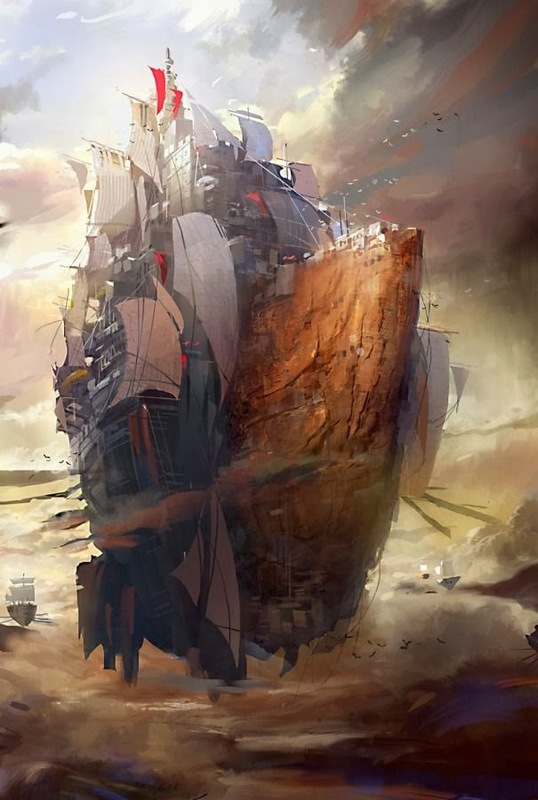 To provide them with a reliable platform, King Rowar II ordered the old Master known simply as The Engineer to design a ship for the Argonauts. 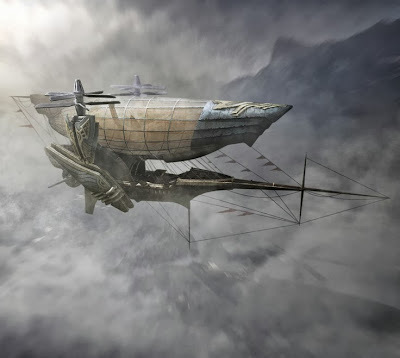 The result was the Skyranger-class sloops-of-war. These vessels are fundamentally different from any other built on Argos, most closely resembling those of the Commonwealth. They are essentially dirigibles, with a narrow ventral hull stretching from the bow to the stern. Unlike all but a few other Argonian ship builders, the Pendrellians do not rely on witchwood. Instead they use Elfash, a type of tree native to Fornost that is extraordinarily susceptible to magic. The Argonauts also do not equip their ships with any conventional system for propulsion, instead relying on the winds and their spells to provide them with speed and manoeuvrability. Each of these ships are crewed by a small cabal of mages, with only a light contingent of crewmen. The university-state of Marburg has long experimented with flight, some say even before the Pendrellians. It may therefore not be surprising that they have developed their own approach to the matter. 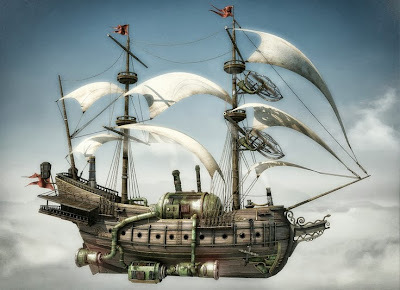 As with most other ship builders, they rely on the all-important witchwood to reduce weight and provide some buoyancy, but there the similarities end. 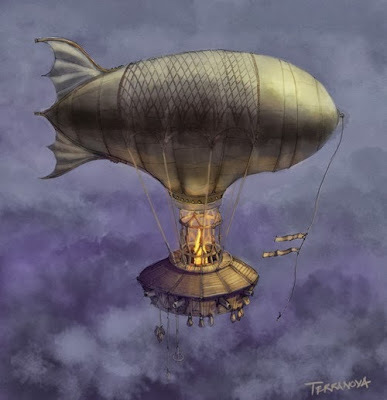 Instead of balloons or dirigibles, the Marburgers have invented a flying machine. This contraption is constructed from a series of secret metanormal alloys, and burns Mana to heat air to such high temperatures that the boiler acts in the same way as a balloon. The excess heat is channelled through an array of exhaust vents that provide propulsion. 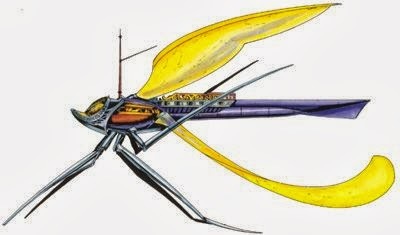 For the wealthy, the Dragonfly offers a way to travel swiftly and in style. Built by the Solano Brothers of Eliesse, these sleek cloudskiffs are constructed from witchwood and spellforged metal. An ingenious quadruple sail configuration allows for both manoeuvrability and propulsion. This is also one of the few skyships capable of landing on solid ground without special a berth. All in all, this vessel is extremely well suited for, and sought after by curers, smugglers, small cabals, and anyone who can afford it. The Elfinspeer is the pride of the Wezellianse Vliegende Mareijne, the flying navy of Wezell, and probably the single fastest ship in the skies. She was commissioned by Onkel van Zaar on behalf of the Syndikaat in YE 1039 and gifted to the state as soon as she was launched. The quadjammer is built entirely of spell-tempered witchwood and is armed with 46 Bansl & Galan Godspear-cannons. Her crew is drawn from the cream of Wezellian airmen and she has a command cabal of five. The current captain of the Elfinispeer is Aleida Smit, daughter of Reichsombudsmann Smit. The Ordo Hermetica does not believe in half-measures. The fortress-ship Katedral is an example of just that, but even that behemoth pales in comparison to the massive Skyfortress Volatrix. It is said that its shadow alone is enough to knock a normal skyship out of the air. More fortified town than anything, this massive vessel is over three hundred yards stem to stern, and almost as tall. 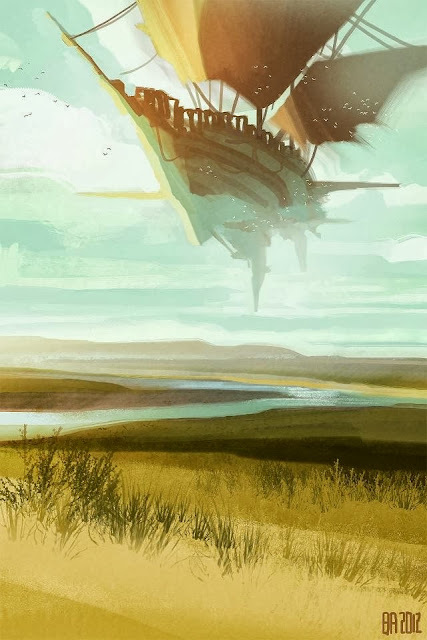 How the northern wizards build it, and how they keep her flying is a mystery, but then that holds true for most things hermetic. The Volatix is commanded by Archmaster Octavian Arbalestus and crewed by an unknown number of mages and proxima. There are at least five hunts of wyverns stationed on the skyfortress at all times. Very cool. Great to see you back blogging. Thanks mate. It's been a while, but it is good to be back. We'll see how long I stay this time.